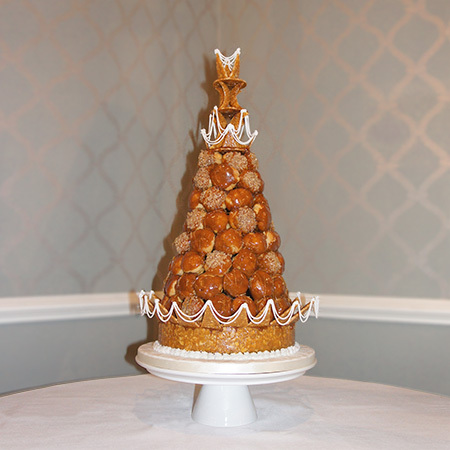 Something a bit different, a croquembouche is a traditional French wedding cake! Stacked high with profiteroles filled with Crème patissiére, flavoured with either orange liquor or vanilla bean syrup. Each profiterole is dipped in caramel and assembled on an almond, caramel nougatine base and decorated with nougatine shapes and finished with piped royal icing droplines. Further decoration can be added to match your wedding theme such as a bride and groom cake topper or sugar crafted flowers and birds. The caramel and nougatine complements the Crème patissiére filled profiteroles however a fudge chocolate sauce for added indulgence is also available. 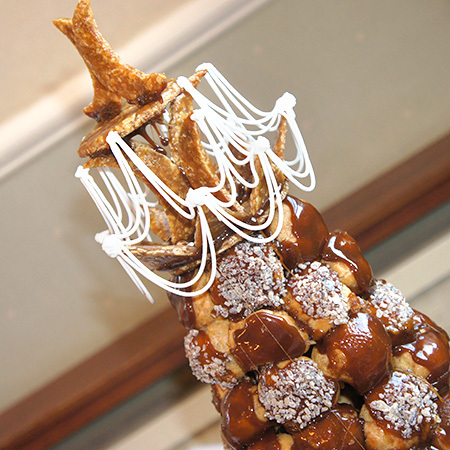 The croquembouche towers can be made with 80 to 200 profiteroles, extra required profiteroles can be severed separately. Prices start from £250 plus delivery. 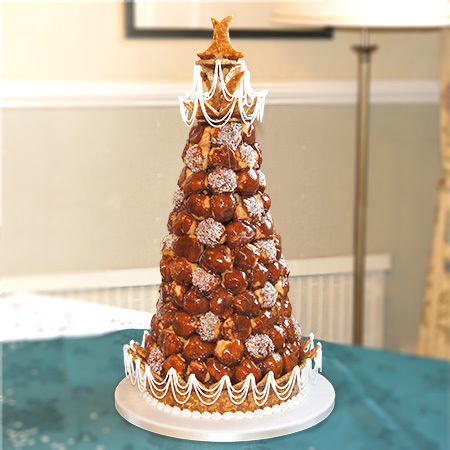 NB: A traditional French croquembouche must be made the day of the event, due to this delivery is only available up to 70 miles from Newbury.